Located in a stunning little bay, Paradisus Playa del Carmen for Adults is the superior luxury resort in the Riviera Maya, combining a prestigious Caribbean setting with world-class facilities, including Royal Service, the ultimate in spa treatments, a relaxed ambience, and flexible meeting spaces with state-of-the-art equipment. This elegant resort has a Mayan ecological feeling, and an oceanfront location surrounded by a lush tropical mangrove preserve and with views of Cozumel Island. Take your senses on a culinary tour through eleven remarkable restaurants serving delicious cuisine from all around the world and ten bars serving unlimited international Premium brand drinks. Enjoy life-enriching experiences such as tango dance classes, sushi-making, and sensorial experiences. 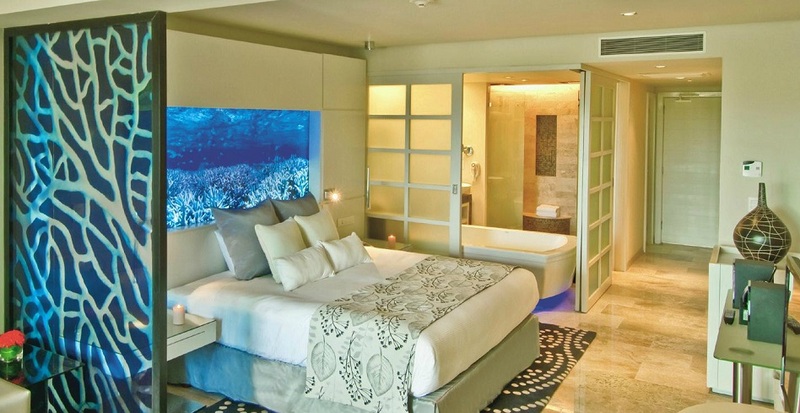 This adults-only luxury All-Inclusive resort is located about 45 minutes from Cancun International Airport and just steps from extraordinary beaches and attractions such as Playa del Carmen’s 5th Avenue, Xcaret, Akumal, Xel-Ha, and near world-famous Mayan archaeological sites such as Tulum, Chichén Itzá and Cobá. Unparalleled. All-encompassing. Elevated, preferential and private. Important: Royal Service rooms are exclusively for adults ages 18 and up. Our full-service health clubs feature state-of-the-art equipment, the guidance of personal trainers, and unique workouts including couples training, group classes and personalized one-on-one wellness programs designed to meet your mind-body goals. Indulge in a world-class spa holiday in the world’s most luxurious surroundings. Contemporary Asian dining experience features separate entrances for adults and families, stunning Japanese Tatami mat flooring and distinct areas – indoor air-conditioned, private dining room, and zen-like terrace – in which to savour Asian fusion cuisine, Teppanyaki tables and an adults-only sushi bar. Robust wine cellar and exclusive themed martini selection invite lingering over pre-dinner cocktails. * Holding bar for Passion and Fuego. Appetites ignite with pre-dinner Tequila and Mezcal specialties and a fully-stocked wine cellar. ** Holding bar for Vento and Mole. Open daily with refreshing tropical cocktails. Copyright © 2014 MLT. All Rights Reserved.